After what has felt like a decade-long wait, fans were treated to a first look at the highly anticipated Suicide Squad during Comic Con 2015. The first official trailer was published on YouTube by Warner Bros. on Monday, July 13, and to say the preview is jaw-dropping would be a massive understatement. I'll admit that I am one of the many who was most excited at a look at Jared Leto's much-hyped portrayal as The Joker, and the actor did not disappoint. Although you basically have to wait until the very end of the trailer to see Leto as the maniacal villain, the terrifying image and grisly sentiment, "I'm not gonna kill ya — I'm just gonna hurt ya really, really bad" is jolting enough to make me consider sleeping with the lights on tonight. Those accolades aside, my favorite parts of the preview actually didn't include The Joker (sorry), but Will Smith as gun-wielding Floyd Lawton/Deadshot. 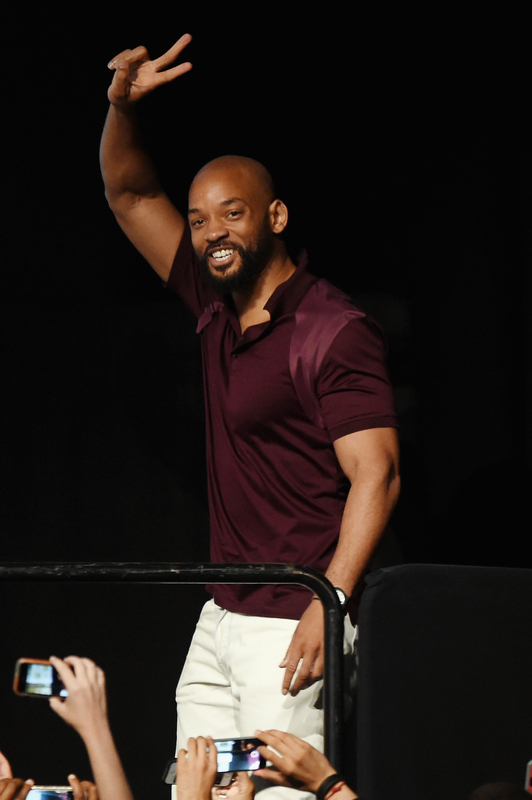 This wouldn't be the first time we would see Smith slay in an action film (hi, Hancock and Independence Day), but — judging from the Suicide Squad trailer — it looks like Smith's Deadshot is poised to steal the entire movie. Yes, really. In case you doubt me, let's take a look at why Smith's Deadshot is going to positively own the highly anticipated Suicide Squad. Our first glimpse of Deadshot shows the antihero wailing on a punching bag. This is an important skill to have in case he loses his weapons during a covert mission. Although he was originally thought of as a maniacal assassin, those familiar with the character know that Deadshot consistently toggles the line between adversary and antihero. His past is marked with family abuse, and it looks like Smith absolutely nails the multiple facets of this troubled character. I spy someone looking dapper as all get-out! When you're a villain and become recruited for a project known as "Task Force X" in exchange for freedom, your initial thought may be, "YAS! Mercy, at last!" Jaded and self-aware Deadshot can see the caveats of such an operation, as he dejectedly refers to himself and the squad as "patsies." He knows what's up. Standing amid flames, Deadshot's "Let's go save the world" line is practically a verbal shrug, because fighting crime and risking life is NBD as far as he's concerned. Did anyone else notice during the trailer that Deadshot is leading the squad, like, all the time? They would probably just be running around willy nilly if he wasn't there. There you have it! Now can 2016 get here already so I can see this epic film?